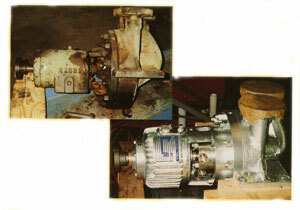 Flowserve, Flow Solutions Divisiony offers upgrades, retrofits, and re-rates for singles stage overhung process pumps. They retrofit vintage pumps to API 8th edition using new or existing casing. Flowserve, Flow Solutions Divisiony also provides larger seal chambers that meet the requirements of API 682. Also available are shaft and bearing systems that improve pump reliability and reduce maintenance costs by replacing older shafts with greater deflections, and new impellers for hydraulic re-rate that improves pump efficiency and operation.